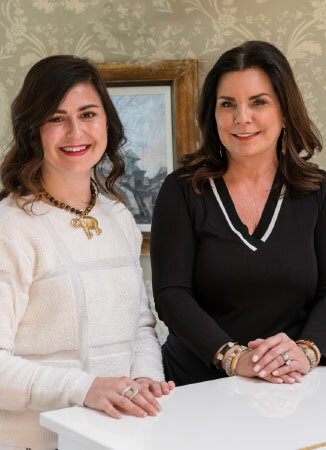 Transforming a Neoclassical mansion into a modern-day oasis was the goal for design duo Lesa Buckler and Christa Rose of Details. The glamorous interior they created achieves all of that and more. At the end of a tree-lined driveway stands a stunning Neo-Classical mansion affectionately named Meadowland. Settled on over 80 acres of park-like grounds, this home is an architectural gem that has been lovingly updated by its owners over the last several years. 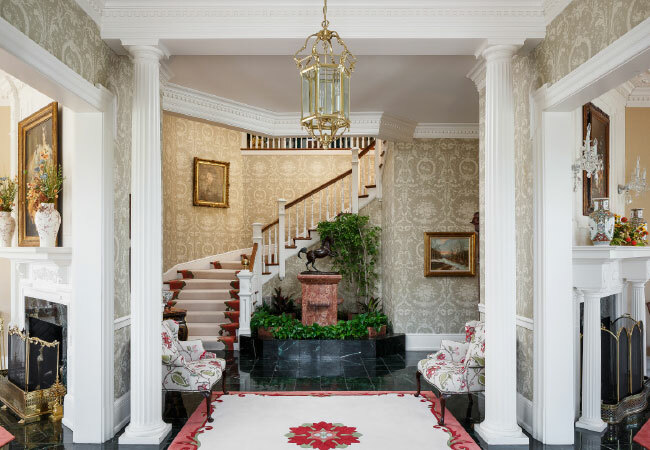 Having lived there for the previous twenty-six, the family appreciated the sense of history and tradition and wanted a design team who could create a stunning oasis while honoring the home’s historic detail and past. Enter Lesa Buckler, owner and principal designer of Details, who had worked with the client’s daughter previously, and Christa Rose, also with Details, who collaborated on a grand creative vision that conveys both a sense of luxury that suits the vast spaces and glamour telegraphed by lush fabrics that give just the right amount of shimmer and movement. The welcoming foyer of Meadowland immediately evokes a feeling of Southern hospitality. The curved stairway, along with the horse bronze mounted atop a marble water fountain, creates an impressive focal point. Matching settees cloaked in fabrics by Jane Churchill, complement the wallpaper and the custom-made rugs. Bright and airy, the adjacent living room is the perfect gathering spot. Wing chairs boast a colorful Colefax and Fowler fabric, while a stylish cut velvet pattern, applied to the English-style sofas, is from Cowton and Tout. Oversized pillows donned with a fabric from Maxwell accentuate the plush and welcoming upholstery. All of the fabrics were selected to complement the colors in the art collection found throughout the home. 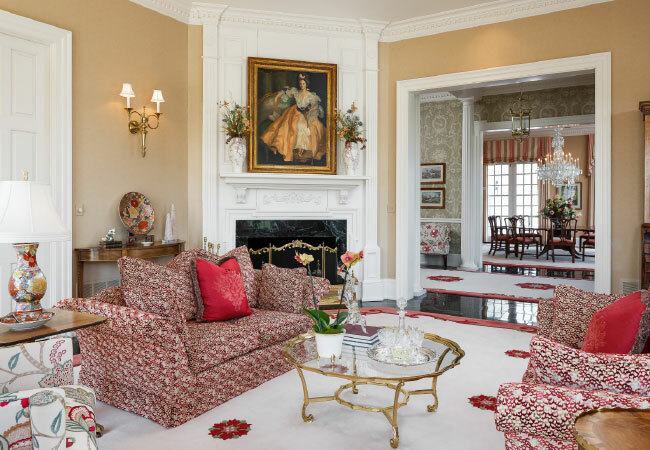 “The homeowner had acquired many wonderful art pieces throughout her years of traveling, so we paid homage to them as well as to the color palette that she loves,” Lesa shared. 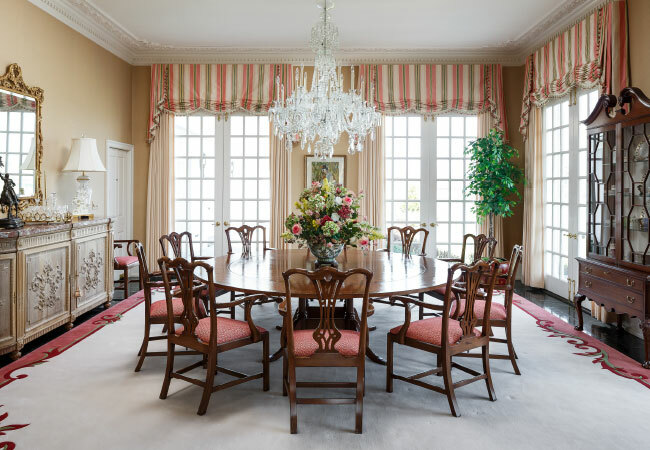 While the homeowner has impeccable furniture selections – like the buffet that was purchased while in Italy or the Chippendale table and chairs from Bittners – Lesa and Christa gave them new life by layering the dining room in sophisticated textiles. The Brunschwig & Fils fabric adds a stylish twist to the chairs and new accessories throughout the room complement the custom made rug that give the space an overall feel of understated elegance. 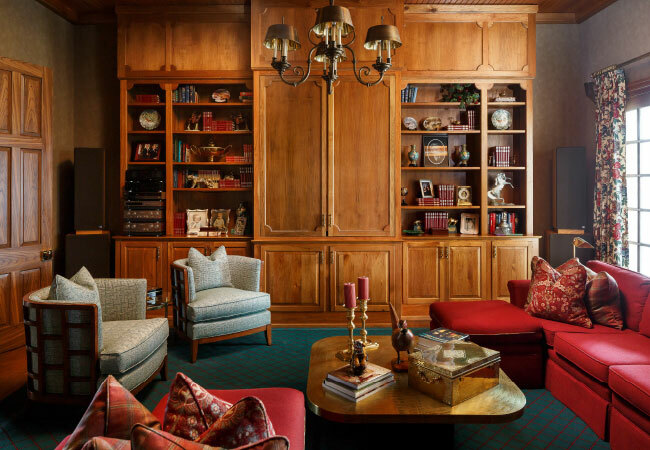 Cozy and intimate, the library is a room that invites relaxation. An abundance of literary selections are close at hand in the built-in bookcases. The loveseat was reimagined with Jane Shelton fabric accentuated with a Cowton & Tout trim. The chairs are finished in a chic Brunschwig & Fils Panthere pattern. The den is full of surprises. “With massive wood paneling, an expansive sunken bar, mirrored glass shelving, and a baby grand piano, the den gives one the feeling of an equestrian club.” This is a favorite gathering spot when entertaining. If guests aren’t positioned at the impressive bar, then they are comfortably seated on the custom built, curved sofa, upholstered in a Colefax and Fowler wool fabric or the stately Lexington Club Chairs. Lesa and Christa enhanced the sofa’s charm with tartan plaid pillows that add an old world vibe. A brass coffee table, purchased in New York, adds a sophisticated twist to the room. Upholstery and fabrics: Colefax and Fowler (living room wing chairs, custom built sofa in the den, drapes and chaise lounge in master suite), Jane Churchill (matching settees in foyer), Brunschwig & Fils (Chippendale chairs in the dining room and chairs in the library), Cowton & Tout (sofa in the living room and trim on sofa in the library), Beacon Hill (club chairs, side chairs, and stools in master suite), and Maxwell (oversized pillows on sofa in the living room. Custom stair runner and rugs in the foyer, library, living and dining room: Designed by Lesa and Christa and manufactured by Fabrica Fine Carpet & Rugs.